Alex Waggoner joins the Gibbes’ Visiting Artist program from July 31 to September 1. Her residency includes open studio hours, an artist tour, and two workshops. Find info at gibbesmuseum.org and alexwaggoner.com. Alex Waggoner wishes we would all just slow down. 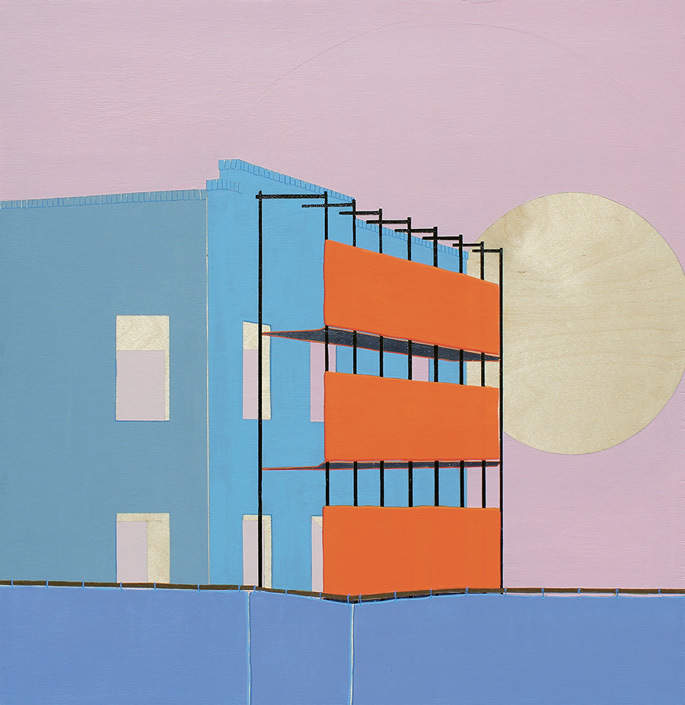 The artist, who studied at SCAD and first landed in Charleston in 2013, paints the city as she sees it, though she eschews the expected pastels in favor of vivid color. And she sees more than most: her works star neglected buildings and structures in varying states of change, demanding we stop to notice them. In the last year and a half, Waggoner debuted two solo exhibitions, “Spruill” at Charleston Music Hall in November of 2017 and “Slow” at Beresford Studios in March. On July 31, she dives into a new project, part of a sought-after summer residency at the Gibbes Museum of Art. SCAD experience: In school, my work was very abstract. I was making a lot of time-based pieces and process paintings. I’d draw these tiny squares all over huge canvases in one sitting, so that the degradation was visible—you could see in the lines how my hand got tired. Falling for Charleston: I interned at Redux after college, so I moved here for the summer of 2013. The buildings were so beautiful, and I found while painting architecture, I could use the same technique of drawing those squares, but translated to physical objects like bricks or siding. It was still that meditative process, but now it had a place. Peninsula living: My favorite way to get inspired is just to walk around. I love living downtown because you can walk anywhere and run into someone you know. I stroll with my dogs, Bishop and Midas, to Hampton Park every day, and my boyfriend [illustrator Chris Nickels] and I will stop at Uneeda Sicilian for a slice, or for breakfast sandwiches at Daps. “Spruill”: Considering the shape of the peninsula, it seems growth can only go in one direction—north, and up Spruill Avenue. I was struck by how precious the buildings there are. My hope with “Spruill” was that people would see the area as more than the next conquest for rapid urban development. The Gibbes residency: I had to propose a project that pairs with one of their exhibitions, so I chose the Miniature Portrait Collection. I’ll make tiny, shaped substrates to paint historic Charleston architecture on, and they’ll be little talismans like the portraits, but of actual buildings instead of faces.